This easy to use encryption software enables you to encrypt and shred any type of file or folder, from within Windows Explorer or My PC with right click ease. The file encryption module lets you protect data on any type of media, like a hard drive, USB Drive, network folder, floppy disk, or DVD, and currently includes a file shredder. Full command line support. The text encryption module lets you send secure email via any email software. CryptoForge 5.4.0 is a shareware program and can be used as a demo to try the software until the free trial period has ended. A full version of the program is available after the trial period ends. 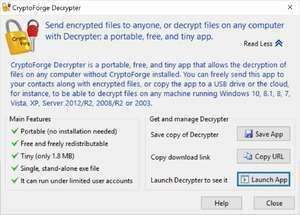 For security reasons, you should also check out the CryptoForge download at LO4D.com which includes virus and malware tests. Additional screenshots of this application download may be available, too.